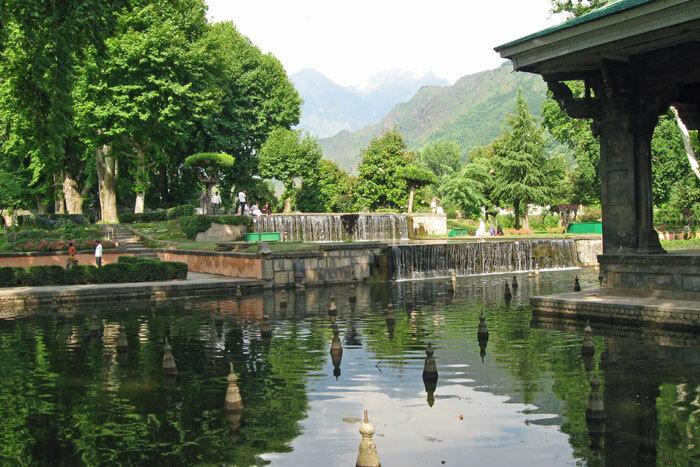 Shalimar Bagh is a Mughal garden in Srinagar, linked through a channel to the northeast of Dal Lake, on its right bank located on the outskirts of Srinagar city in Jammu and Kashmir. Its other names are Shalimar Garden, Shalimar Bagh, Farah Baksh and Faiz Baksh, and the other famous shore line garden in the vicinity is Nishat Bagh. The Bagh was built by Mughal Emperor Jahangir for his wife Noor Jahan, in 1619. The Bagh is considered the high point of Mughal horticulture. It is now a public park. The layout of the garden is an adaptation of another Islamic garden layout known as the Persian gardens. This garden built on a flat land on a square plan with four radiating arms from a central location as the water source. It needed to be modified to suit the hilly terrain and availability of a well, which could be diverted from a higher elevation to the planned gardens. Modifications involved the main channel running through the garden axially from top to the lowest point. This central channel, known as the Shah Nahar, is the main axis of the garden. It runs through three terraces. This layout left out the radial arms and the shape became rectangular, instead of a square plan of the Chahar Bagh. The garden, as final lay out, covers an area of 12.4 hectares (31 acres) built with a size of 587 metres (1,926 ft) length on the main axis channel and with a total width of 251 metres (823 ft). The garden has three terraces fitted with fountains and with chinar (sycamore) tree-lined vistas. The Shahnahar is the main feeder channel to all the terraces. Each one of the three terraces has a specific role. The garden was linked to the open Dal Lake water through a canal of about 1 mile (1.6 km) length and 12 yards (11 m) in width that ran through swampy quagmire. Willow groves and rice terraces fringed the lake edge. Broad green paths bordered the lake with rows of chinar trees. The garden was laid in trellised walkways lined by avenues of aspen trees planted at 2 feet (0.61 m) interval. The architectural details of the three terraces of the garden are elaborate. The first terrace is a public garden or the outer garden ending in the Diwan-e-Aam (public audience hall). In this hall, a small black marble throne was installed over the waterfall. The second terrace garden along the axial canal, slightly broader, has two shallow terraces. The Diwan-e-Khas (the Hall of Private Audience), which was accessible only to the noblemen or guests of the court, now derelict, is in its centre. However, the carved stone bases and a fine platform surrounded by fountains are still seen. The royal bathrooms are located on the north-west boundary of this enclosure. The fountain pools of the Diwan-e-Khas, the Diwan-e-Aam, and in turn, the Zenana terrace ae supplied in succession. It has 410 fountains. In the third terrace, the axial water channel flows through the Zenana garden, which is flanked by the Diwan-e-Khas and chinar trees. At the entrance to this terrace, there are two small pavilions or guard rooms (built in Kashmir style on stone plinth) that is the restricted and controlled entry zone of the royal harem. Shahajahan built a baradari of black marble, called the Black Pavilion in the zenana garden. It is encircled by a fountain pool that receives its supply from a higher terrace. A double cascade falls against a low wall carved with small niches (chini khanas), behind the pavilion. Two smaller, secondary water canals lead from the Black Pavilion to a small baradari. Above the third level, two octagonal pavilions define the end wall of the garden. The baradari has a lovely backdrop of the Snow Mountains, which is considered a befitting setting for the Bagh. The Shalimar Bagh is well known for chini khanas, or arched niches, behind garden waterfalls. They are a unique feature in the Bagh. These niches were lighted at night with oil lamps, which gave a fairy tale appearance to the water falls. However, now the niches hold pots of flower pots that reflect their colours behind the cascading water. Another unusual architectural feature mentioned is about the doors of the Baradari. In the garden complex, the Baradari had four exquisite doors made of stones supported by pillars. It is conjectured that these stone doors were ruins from old temples that were demolished by Shahajahan. The garden also provided large water troughs where a variety of fountains were fixed.